There's a certain fascination in tales of stalwart young folks who disappear into the Alaskan wilderness, never to return - witness the recent success of the film version of Jon Krakauer's Into the Wild. Disaster stories also exert a primal pull. Waitsfield author James Tabor crafted both when he wrote Forever on the Mountain: The Truth Behind One of Mountaineering's Most Controversial and Mysterious Disasters, his account of an ill-fated 1967 group climb up Mount McKinley (now Denali). Tabor, a journalist and History Channel producer, researched his book extensively. Earlier this month he snagged two honors for his efforts: Forever on the Mountain won the Grand Prize at the Banff Mountain Book Festival and was one of two winners in the History/Biography category of the National Outdoor Book Awards, sponsored by Idaho State University and the Association of Outdoor Recreation and Education. 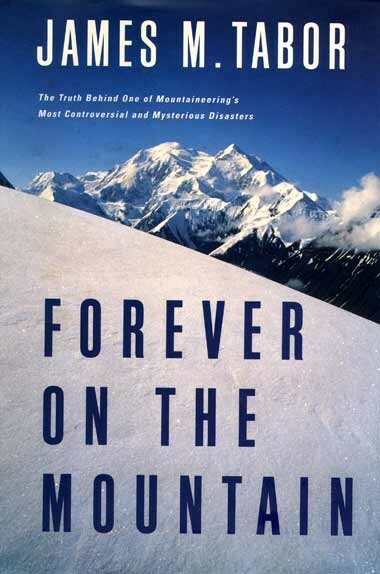 Forever on the Mountain, previously reviewed in this paper by Sarah Tuff, has also garnered some interesting user comments on Amazon.com, where the hardcover currently ranks about 10,000 in sales. One reader named "Cheryl" - perhaps Cheryl Wilcox, ex-wife of 1967 McKinley expedition leader Joe Wilcox - writes: "As a person who had close ties to the expedition, both in the planning and the aftermath, I found this book to be an accurate account of the tragic events that occurred." Another user identifies himself as "P. [Paul] Schlichter," a survivor of the climb who later cast doubt on Wilcox's leadership. He calls Tabor's book "very well researched and well written," but criticizes the author for speculating that efficient park-service action could have averted the tragedy, saying, "To me there is no great mystery . . . Changes would not have resulted in saving the seven lives." Yet another commenter, who claims he was on Denali's South Face while Wilcox's expedition climbed the North, recalls "being locked in a two-man tent for 10 days during the big storm." Readers who prefer to experience crevasses and whiteouts vicariously can also pick up Tabor's 400-page tome as an unabridged audiobook.